Tarik Cyril Amar is an Associate Professor of History at Koç University. Follow him on Twitter @TarikCyrilAmar. Imagine a superpower founded on a revolution inspired by Enlightenment values (often honored in the breach), great violence liberally applied and mostly badly remembered, and a myth of exceptionalism and superior progress that even its critics find hard to fully escape. Our superpower’s global reach and bite commands if not the respect then at least the fear of the world in a manner second to no other state on the planet. While its adventures abroad are often less than successful and leave corpses and ruins in their wake, it is or feels so strong that that doesn’t teach it much. Its domestic politics are close to stagnation, as visitors can quickly guess from its almost comically decrepit infrastructure so clearly not in sync with the ability of its scientists, engineers, and workers or its claims of indispensable leadership. Its ruling elite is irrationally and obstinately wedded to hoary old dogmas – originally imported from dour European ideologists – about the relationship between the economy and politics. Increasing numbers of its ordinary citizens, meanwhile, are not only unhappy about specific policies but – much more worryingly – about the system as a whole, its principles, institutions, and representatives. There is a widespread and plausible sense that the elites – in politics, the economy, and the media – have built themselves a privileged world of careerist cynicism, lying as a way of life, corruption without limits or regrets, and, last but not least, gross impunity. This loss of faith in the political and social order is reflected in the rise of a desperately dark sense of humor. Especially the young wonder with increasing trepidation what fate awaits them in the world their elders have unmade. Even some former insiders and dissident elite members speak of the deep perversion of the system they know so well. Some citizens are even doubting the literally fundamental ideas and heroes of the original revolution. This is, of course, a description of the late Soviet Union, the other superpower of the Cold War and the only state that, for now at least, could ever claim to have – very unwisely – challenged and stood its ground against post-World War Two America, for a while and at crippling cost. Despite all the well-known differences, it is also, equally obviously, a description of the USA about one generation after the Cold War ended and the collapse of the Soviet Union. Where doctrinaire anti-capitalism mightily helped the Soviets dig their own grave, doctrinaire pro-capitalism might still do the job for their old nemesis, especially under conditions of expensive militarism, another similarity. And where the simple-minded veneration of Lenin, the Soviet founding father, could not survive the deeply unsatisfying reality of the state he created, perhaps the flagrant flaws of American politics may finally end up toppling slave-holding founding fathers from their pedestals as well. Yet despite – or because? – of this bleak picture, we have just seen a collective outpour of nostalgic triumphalism. Intriguingly, it focuses on the American leader during whose reign the Soviet Union breathed its last, George Bush I. After his passing away, most of the US media have exploited the traditional convention of the eulogy – to speak nothing but good of the dead – to engage in a collective fit of national self-adoration that Pravda might have been proud of. Almost everything about this exhibitionist wave of nostalgia is wrong. Bush I was not a kind king, but a ruthless wielder of power, at home and abroad. Let’s focus, however, on just one element of this love fest for the powers that be – or at least were – namely the bizarre yet popular claim that Bush I managed the end of the Cold War well. This is factually misleading and chockfull of bad politics as well. Here is why: First of all, the Cold War did not end under Bush I, the Soviet Union did. The Cold War was over by the time, Bush I came into power. If we want to be nice to an arch-conservative American president for making a contribution to ending it – by taking Soviet initiatives seriously – that would be Ronald Reagan. Why does that matter? Certainly not because Reagan must have his share of the glory. As almost all presidents, he will always be served well enough with adulation, deserved or, mostly, not. What we lose by misdating the end of the Cold War is a sense of how unlikely it was, not, at that point, because of the Soviets but because of the American establishment. Reagan’s one positive contribution to world history – after the war scares of 1983 which he helped bring about – was to go against the blob. Ironically, he did so precisely because he had that “vision thing” that Bush I would later mock. It was not the WASPs and their vaunted get-things-done sobriety that helped end the Cold War, but the wild-eyed if oddly placed utopianism of a former Hollywood actor. Thus no, this is not a lesson about trusting traditional elites to manage the world well – sorry, Ross Douthat. We also gain something by conflating the end of the Cold War and that of the Soviet Union – and that is even worse, namely a blinding bias: If we pretend that the Cold War only ended when and because the Soviet Union disappeared, we imply that this was a war that could only end with the total defeat, even the annihilation – if, in this case, mostly peacefully – of the opponent. That is, of course, a favorite illusion of the American right and, alas, center. 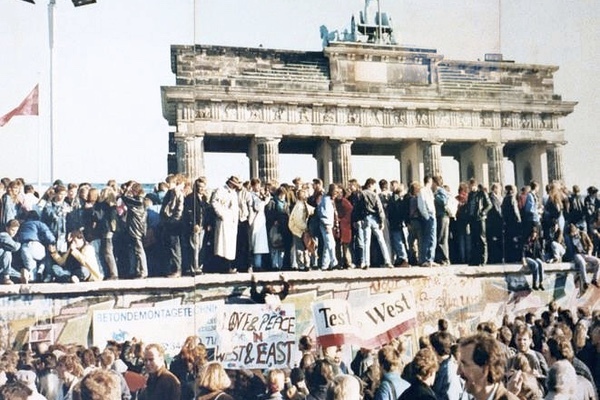 Here, the end of the Cold War morphs into the greatest case of successful regime change yet – and an eternal reminder that there are no alternatives. Thus, the lesson implied is to never seek compromise with irritatingly, obstinately, unbearably other Others but, instead, insist that they become like us, whether they want to or not. Yet, in reality, compromise – if much in favor of the USA – is exactly how the Cold War really ended. Put differently, it is a fallacy to believe that the USA won the Cold War because the Soviet Union lost it. Yes, the Soviets did lose it, but America, fortunately, initially only took advantage withoutinsisting on winning. That was the key to its end. Which brings us to what happened afterwards, namely Bush I beginning to mess up the ensuing peace (an endeavor then continued by his successor Bill Clinton), in two ways at least: just after the Soviet Union had ceased to exist, in his State of the Union Address of January 1992, he could not resist crowing about America having won the Cold War, quite blasphemously, invoking higher powers as well. Indeed, he rubbed it in, making a point of insisting that the Cold War had not “ended” (his scare quotes) but been won. And he presided over a war against Iraq that demonstrated that the post-Cold War “New World Order” would be one of America having it its way even more than before. In both instances, he did not create but helped along the Russian bitterness and self-pity that has since grown strident. He also promoted the American elite arrogance that has since grown self-defeating. It’s not as if America could not learn anything from looking at Russia, but it has a habit of getting the lessons wrong. Watching Putin, it fails to see that his attempts to influence its politics are much less important than the deep capitalist-oligarchic convergence between the two countries. Looking at the end of the Soviet Union, America fails to see that what lost the Cold War for its old best enemy was the hubris of super-powering-while-declining. What then killedit was its own failure to address its glaring flaws at home quickly and effectively enough and, of course, a ruthlessly self-interested elite that put its own careers, power, and profit above everything else.